I’m fairly excited. I truly am. 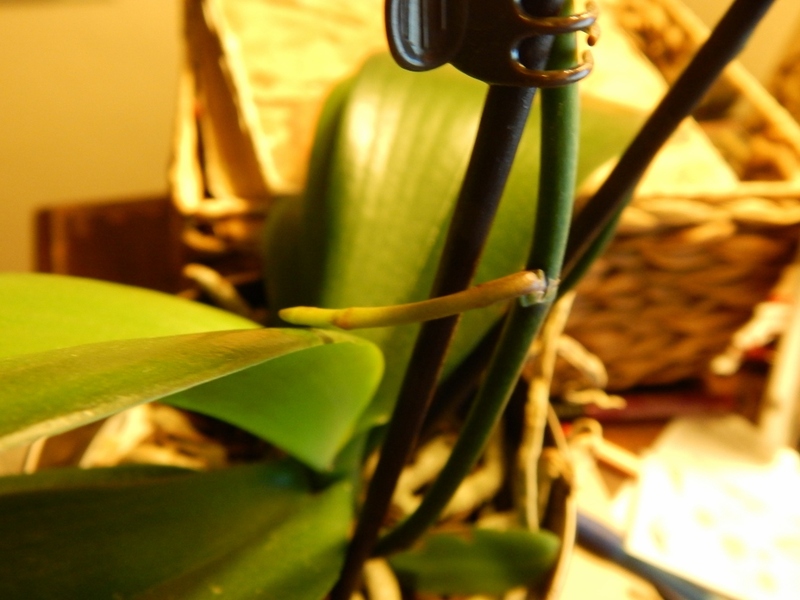 I came in from my dark, 10 degree F (-12 C) work commute to discover one of my orchids seems to be growing! There are new leaves and “shoots” (for lack of a better word) coming off the stems. Could this plant actually be–dare I say it–thriving? I find the world of houseplants to be more frustrating than my garden. Mostly it’s because I have limited space for them. But I enjoy the green beauty of a houseplant, especially in winter. I have two orchids, both from the grocery store, that were given to me as gifts. I believe they are Phalaenopsis or “moth orchids.” My first orchid was given to me two years ago at Christmas, and, it’s not doing the greatest (more on that in a minute). My performing orchid was given to me in August; both were in glorious bloom when I received them. Of course, I watched, misted, fed and fretted what I should do when the blooms die. Do I cut the stems down? The instructions on both tags told me to give the orchid 3 ice cubes a week. And to give it plenty of light. Check. Check. No problem following those simple instructions. The browning stem makes me nervous? Do I cut this completely down? Trim it as it browns? Leave it alone? This time I opted to leave it alone. But I do get nervous once the blooms fade and fall off. That’s because the stems begin to turn brown from the top down. Yikes, do I cut that off? Just trip off the dead stuff down to the nodule on the stem? Well, on the first plant I cut the stems when they completely turned brown and looked dead. I figured the plant would grow new stems. Hmmmmm, not so much. 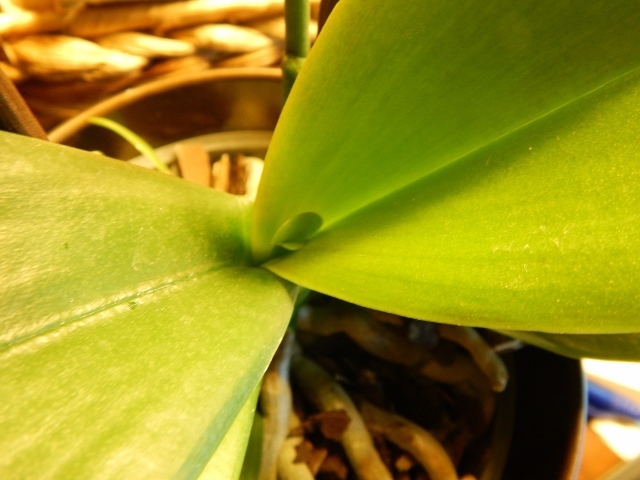 There’s new growth emerging from the stem of Orchid #2. So when plant #2’s blooms faded and fell, I repeated the same step. Only this time, the stems are not completely brown and growth is coming off the nodules of the stem. And–yes, there’s more good news here–there is new leaf growth. 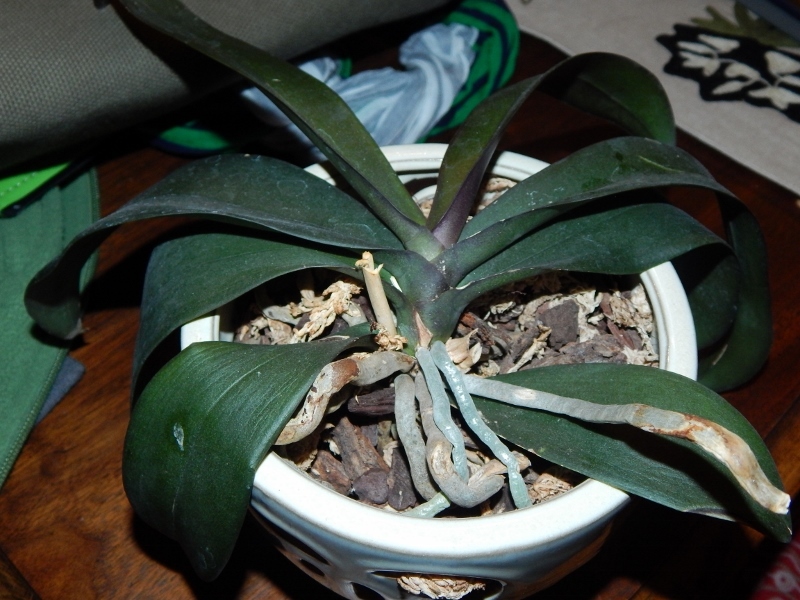 Truthfully, that does not excite me nearly as much as the stem growth because Orchid #1 had lots and lots of leaf and root growth after the stems died. In fact, it had so much leaf and root growth that I re-potted it after I had it more than a year and it seemed rather apparent that it was not going to rebloom. I thought that perhaps the thing was root bound. 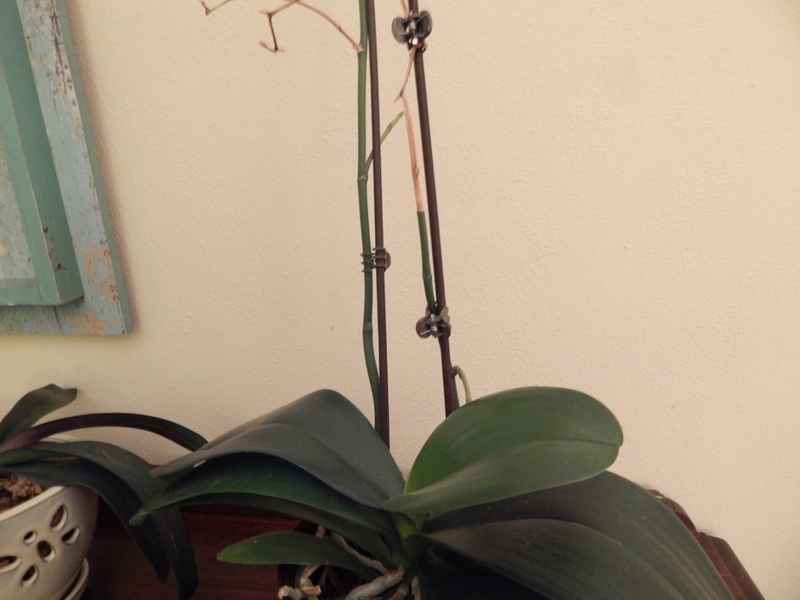 Orchid #1 doesn’t seem so happy, even though I have treated it the same way as its sibling orchid. What gives? I went to one of my favorite nurseries, bought a pot and planting material. I already had the orchid food, and the ice cubes. But I got nothing; the poor thing has not performed. Maybe sibling rivalry will kick in and will start doing something, lest it be shown up by its younger sister. Categories: Plants | Tags: house plants, Orchids | Permalink.